Energy storages have caught the attention of transportation community for the past several years. Recent developments in hybrid and plug-in electric vehicles together with novel concepts in transportation such as electric highways are the reasons for raising the role of energy storages in transportation to such a significant level. Performance demands for energy storage solutions vary significantly from one transportation application to the other, making it difficult for the scientific community to converge to a single energy storage solution that caters all. This paper reviews the key performance demands of the major transportation applications. It also investigates the characteristics of emerging energy storage solutions and assess their suitability for those reviewed transportation applications. IEEE Transactions on Industrial Electronics, vol. 55, no. 6, pp. 2258-2267, June 2008.
applications,” IEEE Transactions on Industrial Electronics, vol. 57, no. 12, pp. 3881-3895, December 2010. Sustainable Energy Reviews, vol. 41, pp. 225-236, 2015.
in Information Age (ICRE 2008), March 2008, pp. 1-6. B. Zahedi, L. E. Norum, and K. B. Ludvigsen, “Optimized efficiency of all-electric ships by DC hybrid power systems,” Journal of Power Sources, vol. 255, pp 341-354, June 2014. S. Mashayekh, W. Zhenyuan, L. Qi, J. Lindtjorn, and T. Myklebust, “Optimum sizing of energy storage for an electric ferry ship,” Proc. IEEE Power and Energy Society General Meeting 2012, July 2012, pp. 1-8. Y. Chuan, G. K. Venayagamoorthy, and K. A. Corzine, “Optimal location and sizing of energy storage modules for a smart electric ship power system,” Proc. IEEE Symposium on Computational Intelligence Applications In Smart Grid (CIASG), April 2011, pp. 1-8. F. D. Kanellos, “Optimal power management with GHG emissions limitation in all-electric ship power systems comprising energy storage systems,” Proc. IEEE Transactions on Power Systems, vol. 29, no. 1, January 2014, pp. 330-339. K. D. Eleftherios, D. A. Hudson, and S. R. Turnock, “Assessing the potential of hybrid energy technology to reduce exhaust emissions from global shipping,” Energy Policy, vol. 40, pp. 204-218, January 2012. D. O. Akinyele and R. K. Rayudu, “Review of energy storage technologies for sustainable power networks,” Sustainable Energy Technologies and Assessments, vol. 8, pp. 74-91, 2014. R. M. Della and D. A. J. Randb, “Energy storage-a key technology for global energy sustainability,” Journal of Power Sources, vol. 100, pp. 2-17, 2001. X. Luo, J. Wang, M. Dooner, and J. Clarke, “Overview of current development in electrical energy storage technologies and the application potential in power system operation,” Applied Energy, vol. 137, pp. 511-536, January 2015. A. Joseph and M. Shahidehpour, “Battery storage systems in electric power systems,” Proc. IEEE power engineering society general meeting, June 2006, pp. 1-8. H. Chen, T. N. Cong, W. Yang, C. Tan, Y. Li, and Y. Ding, “Progress in electrical energy storage system: a critical review,” Progress in Natural Science, vol. 19, pp. 291-312, March 2009. M. Beaudin, H. Zareipour, A. Schellenberglabe, and W. Rosehart, “Energy storage for mitigating the variability of renewable electricity sources: an updated review,” Energy for Sustainable Development, vol. 14, no. 4, pp. 302-314, December 2010. I. Hadjipaschalis, A. Poullikkas, and V. Efthimiou, “Overview of current and future energy storage technologies for electric power applications,” Renewable and Sustainable Energy Reviews, vol. 13, no. 6-7, pp. 1513-1522, August-September 2009. J. Kondoh, I. Ishii, H. Yamaguchi, A. Murata, K. Otani, and K. Sakuta, “Electrical energy storage systems for energy networks,” Energy Conversion and Management, vol. 41, pp. 1863-1874, Febuary 2000. F. Díaz-González, A. Sumper, O. Gomis-Bellmunt, and R. Villafáfila-Robles, “A review of energy storage technologies for wind power applications,” Renewable and Sustainable Energy Reviews, vol. 16, pp. 2154-2171, May 2012. T. Christen and M. W. Carlen, “Theory of ragone plots,” Journal of power sources, vol. 91, no. 2, pp. 210-216, December 2000. T. Christen and C. Ohler, “Optimizing energy storage devices using ragone plots,” Journal of Power Sources, vol. 110, no. 1, pp. 107-116, July. 2002. C. R. Akli, X. Roboam, B. Sareni, and A. Jeunesse, “Energy management and sizing of a hybrid locomotive,” Proc. IEEE European Conference on Power Electronics and Applications 2007, pp. 1-10, September 2007. S. Alahakoon and M. Leksell, “Emerging energy storage solutions for transportation-a review: an insight into road, rail, sea and air transportation applications,” Proc. 2015 International Conference on Electrical Systems for Aircraft, Railway, Ship Propulsion and Road Vehicles (ESARS), March 2015, pp. 1-6. Y. Kuang, Y. Chen, M. Hu, and D. Yang, “Influence analysis of driver behaviour and building category on economic performance of electric vehicle to grid and building integration,” Applied Energy, vol. 207, pp. 427-437, December 2017. M. A. Quddus, O. Shahvari, M. Marufuzzaman, J. M. Usher, and R. Jaradat, “A collaborative energy sharing optimization model among electric vehicle charging stations, commercial buildings, and power grid,” Applied Energy, vol. 229, pp. 841-857, November 2018. N. Ghaviha, J. Campillo, M. Bohlin, and E. Dahlquist, “Review of application of energy storage devices in railway transportation,” Energy Procedia, vol. 105, pp. 4561-4568, May 2017. S. Alahakoon, “Significance of energy storages in future power networks,” Energy Procedia, vol. 110, pp. 14-19, March 2017. W. Rahul and J. Apt, “Market analysis of emerging electric energy storage systems,” The National Energy Technology Lab Report, July. 2008. J. M. Miller, “Energy storage system technology challenges facing strong hybrid, plug-in and battery electric vehicles,” Proc. IEEE vehicle power and propulsion conference, September 2009, pp. 4-10. S. Kusdogan, “Evaluation of battery energy storage system for hybrid and electric vehicle,” Proc. International Aegean conference on electrical machines and power electronics, June 2001, pp. 79-82. M. A. Fetcenko, S. R. Ovshinsky, B. Reichman, K. Young, C. Fierro, J. Koch, A. Zallen, W. Mays, and T. Ouchi, “Recent advances in NiMH battery technology,” Journal of Power Sources, vol. 165, no. 2, pp. 544-551, March 2007. V. G. Lacerda, A. B. Mageste, I. J. B. Santos, L. H. M. da Silva, and M. do.C. H. Da Silva, “Separation of Cd and Ni from Ni-Cd batteries by an environmentally safe methodology employing aqueous two-phase systems,” Journal of Power Sources, vol. 193, pp. 908-913, September 2009. D. Linden and T.B. Reddy (Editors), Handbook of batteries, 3rd Ed., New York: McGraw-Hill, 2002, pp. 18-28. J. Prakash, L. Redey, P. A. Nelson, and D. R. Vissers, “High-temperature sodium nickel chloride battery for electric vehicles”, Proc. 190th Meeting of The Electrochemical Society, July 1996. R. Manzoni, “Sodium nickel chloride batteries in transportation applications.” Proc. IEEE International Conference on Electrical Systems for Aircraft, Railway, Ship Propulsion and Road Vehicles (ESARS), March 2015, pp. 1-6. C. Capasso, V. Sepe, O. Veneri, M. Montanari, and L. Poletti, “Experimentation with a ZEBRA plus EDLC based hybrid storage system for urban means of transport.” Proc. IEEE International Conference on Electrical Systems for Aircraft, Railway, Ship Propulsion and Road Vehicles (ESARS), March 2015, pp. 1-6. 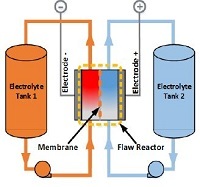 J. Campillo, N. Ghaviha, N. Zimmerman, and E. Dahlquist, “Flow batteries use potential in heavy vehicles.” Proc. IEEE International Conference on Electrical Systems for Aircraft, Railway, Ship Propulsion and Road Vehicles (ESARS), March 2015, pp. 1-6. A. González-Gil, R. Palacin, and P. Batty, “Sustainable urban rail systems: strategies and technologies for optimal management of regenerative braking energy,” Energy conversion and management, vol. 75, pp. 374-388, November 2013. M. R. Giuliano, A. K. Prasad, and S. G. Advani, “Experimental study of an air-cooled thermal management system for high capacity lithium-titanate batteries,” Journal of Power Sources, vol. 216, pp. 345-352, October 2012. M. R. Giuliano, A. K. Prasad, and S. G. Advani, “Thermal analysis and management of lithium-titanate batteries,” Journal of Power Sources, ISSN 0378-7753, vol. 196, no. 15, pp. 6517-6524, August 2011. P. F. Ribeiro, B. K. Johnson, M. L. Crow, A. Arsoy, and Y. Liu, “Energy storage systems for advanced power applications,” Proc. IEEE, vol. 89, no. 12, December 2001, pp. 1744-1756. L. T. Lam and R. Louey, “Development of ultra-battery for hybrid-electric vehicle applications,” Journal of Power Sources, vol. 158, no. 2, pp. 1140-1148, August 2006. U. Bossel, “Does a hydrogen economy make sense?” Proc. IEEE, vol. 94, no. 10, October 2006, pp. 1826-1837. S. S. Saha, “Efficient soft-switched boost converter for fuel cell applications,” International journal of hydrogen energy, vol. 36, no. 2, pp. 1710-1719, January 2011. H. Chen, T. N. Cong, W. Yang, C. Tan, Y. Li, and Y. Ding, “Progress in electrical energy storage system: a critical review,” Progress in Natural Science, vol. 19, no. 3, pp. 291-312, March 2009. P. J. Grbovic, “Ultra-capacitors in power conversion systems: applications, analysis and design from theory to practice,” 1st Ed., West Sussex: John Wiley & Sons, 2014. J. Zhang, L. Zhang, H. Liu, A. Sun, and R. Liu, “Electrochemical technologies for ES and conversion”, Wiley-VCH Verlag GmbH & Co. KGaA, 2012. S. Y. Choe, J. G. Lee, J.W. Ahn, and S. H. Baek, “Integrated modeling and control of a PEM fuel cell power system with a PWM DC/DC converter,” Journal of Power Sources, vol. 164, no. 2, pp. 614-623, Febuary 2007. H. E. Fadil, F. Giri, and J. M. Guerrero, “Adaptive sliding mode control of interleaved parallel boost converter for fuel cell energy generation system,” Mathematics and Computers in Simulation, vol. 91, pp. 193-210, May 2013. A. Kirubakaran, S. Jain, and R. K. Nema, “A review on fuel cell technologies and power electronic interface,” Renewable and Sustainable Energy Reviews, vol. 13, no. 9, pp. 2430-2440, December 2009. M. Walters, A. Kuhlmann, and J. Ogrzewalla. “Fuel cell range extender for battery electric vehicles.” Proc. 2015 International Conference on Electrical Systems for Aircraft, Railway, Ship Propulsion and Road Vehicles (ESARS), March 2015, pp. 1-6. G. O. Cimuca, C. Saudemont, B. Robyns, and M. M. Radulescu, “Control and performance evaluation of a flywheel energy-storage system associated to a variable-speed wind generator,” IEEE Transactions on Industrial Electronics, vol. 53, no. 4, pp. 1074-1085, June 2006. R. G. Lawrence, K. L. Craven, and G. D. Nichols, “Flywheel UPS,” IEEE Industry Applications Magazine, vol. 9, no. 3, pp. 44-50, May-June 2003. M. M. Flynn, P. Mcmullen, and O. Solis, “Saving energy using flywheels,” IEEE Industry Applications Magazine, vol. 14, no. 6, pp. 69-76, November-December 2008. T. M. Mulcahy, J. R. Hull, K. L. Uherka, R. C. Niemann, R. G. Abboud, J. P. June a, and J. A. Lockwood, “Flywheel energy storage advances using HTS bearings,” IEEE Transactions on Applied Superconductors, vol. 9, no. 2, pp. 297-300, June 1999. R. Hebner, J. Beno, and A. Walls, “Flywheel batteries come around again,” IEEE Spectrum, vol. 39, no. 4, pp. 46-51, April 2002. R. Jan and B. Lalande. “Combining energy with power: lithium-ion capacitors.” Proc. 2015 International Conference on Electrical Systems for Aircraft, Railway, Ship Propulsion and Road Vehicles (ESARS), March 2015, pp. 1-6. A. Quadrelli, G. Gigliucci, E. Pasca, S. Farnesi, R. Gambuti, F. Flamingo, and G. Bosia, “Power quality conditioning system based on lithium-ion ultracapacitors for electric vehicles quick charging stations.” Proc. 2015 International Conference on Electrical Systems for Aircraft, Railway, Ship Propulsion and Road Vehicles (ESARS), March 2015, pp. 1-6. M. Steiner, J. Scholten, “Energy storage on board of railway vehicles,” Proc. European Conference on Power Electronics and Applications, September 2005, pp. 10. S. Lu, D. H. Meegahawatte, S. Guo, S. Hillmansen, C. Roberts, and C. J. Goodman, “Analysis of energy storage devices in hybrid railway vehicles,” Proc. International Conference on Railway Engineering-Challenges for Railway Transportation in Information Age (ICRE), March 2008, pp. 1-6. R. Takagi, “Energy saving techniques for the power feeding network of electric railways,” IEEJ Transactions on Electrical and Electronic Engineering, vol. 5, no. 3, pp. 312-316, April 2010. M. Steiner and J. Scholten, “Energy storage on board of DC fed railway vehicles PESC 2004 conference in Aachen, Germany,” Proc. IEEE 35th Annual Power Electronics Specialists Conference (PESC), vol. 1, June 2004, pp. 666-671. D. Iannuzzi, “Improvement of the energy recovery of traction electrical drives using supercapacitors,” Proc. 13th Power Electronics and Motion Control Conference (EPE-PEMC), September 2008, pp. 1469-1474. A. González-Gil, R. Palacin, P. Batty, and J. P. Powell, “A systems approach to reduce urban rail energy consumption,” Energy Conversion and Management, vol. 80, pp. 509-524, April 2014. Á. J. López-López, R. R. Pecharromán, A. Fernández-Cardador, and A. P. Cucala, “Assessment of energy-saving techniques in direct-current-electrified mass transit systems,” Transportation Research Part C: Emerging Technologies, vol. 38, pp. 85-100, January 2014. T. Konishi, H. Morimoto, T. Aihara, and M. Tsutakawa, “Fixed energy storage technology applied for DC electrified railway,” IEEJ Transactions on Electrical and Electronic Engineering, vol. 5, no. 3, pp. 270-277, 2010. L. Battistelli, F. Ciccarelli, D. Lauria, and D. Proto, “Optimal design of DC electrified railway stationary storage system,” Proc. IEEE International Conference on Clean Electrical Power, pp. 739-745, June 2009. A. González-Gil, R. Palacin, and P. Batty, “Optimal energy management of urban rail systems: key performance indicators,” Energy Conversion and Management, vol. 90, pp. 282-291, January 2015. S. D. L. Torre, A. J. Sánchez-Racero, J. A. Aguado, M. Reyes, and O. Martianez, “Optimal sizing of energy storage for regenerative braking in electric railway systems,” IEEE Transactions on Power Systems, vol. 30, no. 3, May 2015. F. Ciccarelli, D. Iannuzzi, “A novel energy management control of wayside Li-Ion capacitors-based energy storage for urban mass transit systems,” Proc. IEEE International Symposium on Power Electronics, Electrical Drives, Automation and Motion (SPEEDAM), June 2012, pp. 773-779. G. Morita, T. Konishi, S. Hase, Y. Nakamichi, H. Nara, and T. Uemura, “Verification tests of electric double-layer capacitors for static energy storage system in DC electrified railway,” Proc. IEEE International Symposium on Power Electronics, Electrical Drives, Automation and Motion (SPEEDAM), June 2008, pp. 1017-1022. R. Barrero, X. Tackoen, and J. Van Mierlo, “Improving energy efficiency in public transport: stationary supercapacitor based energy storage systems for a metro network,” Proc. IEEE Vehicle Power and Propulsion Conference (VPPC 08), September 2008, pp. 1-8. M. Thiounn-Guermeur, “Evaluation of the hybrid locomotive” PLATHEE”-A platform for energy efficiency and environmentally friendly hybrid trains,” Proc. World Congress on Railway Research (WCRR), May 2011, pp 1-10. A. R. Miller, K. S. Hess, T. L. Erickson, and J. L. Dippo, “Fuelcell-hybrid shunt locomotive: largest fuel cell land vehicle,” Proc. IET Conference on Railway Traction Systems (RTS 2010), April 2010, pp. 1-5. B. Asaei and M. Amiri, “High efficient intelligent motor control for a hybrid shunting locomotive. Proc. IEEE Vehicle Power and Propulsion Conference (VPPC 2007), September 2007, pp. 405-411. S. Sone, “Improvement of traction power feeding/regeneration system by means of energy storage devices,” Proc. Electrical Systems for Aircraft, Railway and Ship Propulsion (ESARS), October 2010, pp. 1-6. S. Hillmansen, “Sustainable traction drives,” Proc. 5th IET Professional Development Course on Railway Electrification Infrastructure and Systems (REIS 2011), June 2011, pp. 255-265. M. Yano, M. Kurihara, and S. Kuramochi, “A new on-board energy storage system for the railway rolling stock utilizing the overvoltage durability of traction motors,” Proc. 13th European Conference on Power Electronics and Applications (EPE 09), September 2009, pp. 1-10. J. Morand, D. Bergogne, P. Venet, A. Sari, and P. Bevilacqua, “An energy saver for tramway networks using double active bridge and supercapacitors,” Proc. 15th European Conference on Power Electronics and Applications (EPE), September 2013, pp. 1-9. M. C. Falvo, R. Lamedica, and A. Ruvio, “Energy storage application in trolley-buses lines for a sustainable urban mobility,” Proc. Electrical Systems for Aircraft, Railway and Ship Propulsion (ESARS), October 2012, pp. 1-6. M. Steiner, M. Klohr, and S. Pagiela, “Energy storage system with ultracaps on board of railway vehicles,” Proc. European Conference on Power Electronics and Applications, September 2007, pp. 1-10. D. Iannuzzi, “Improvement of the energy recovery of traction electrical drives using supercapacitors,” Proc. 13th Power Electronics and Motion Control Conference (EPE-PEMC 2008), September 2008, pp. 1469-1474. M. Miyatake and H. Haga, “Optimization of speed profile and quick charging of a catenary free train with on-board energy storage,” Proc. Electrical Systems for Aircraft, Railway and Ship Propulsion (ESARS), October 2010, pp. 1-6. W. Dewei, Z. Kun, W. Shenrong, Y. Zhongping, and Y. Xiaojie, “Power distribution control strategy of on-board supercapacitor energy storage system of railway vehicle,” Proc. International Conference on Materials for Renewable Energy & Environment (ICMREE), May 2011, pp. 664-668. L. Streit and P. Drabek, “Simulation and emulation of tram with onboard supercapacitors on Pilsen tram line,” Proc. International Conference on Clean Electrical Power (ICCEP), June 2013, pp. 703-706. E. K. Dedes, D. A. Hudson, and S. R. Turnock, “Assessing the potential of hybrid energy technology to reduce exhaust emissions from global shipping,” Energy Policy, vol. 40, pp. 204-218, January 2012. F. D. Kanellos, “Optimal power management with GHG emissions limitation in all-electric ship power systems comprising energy storage systems,” IEEE Transactions on Power Systems, vol. 29, no. 1, pp. 330-339, January 2014. S. Mashayekh, W. Zhenyuan, L. Qi, J. Lindtjorn, and T. Myklebust, “Optimum sizing of energy storage for an electric ferry ship,” Proc. IEEE Power and Energy Society General Meeting, July 2012, pp. 1-8. R. R. Chane, S. D. Sudhoff, and E. L. Zivi, “An approach to optimally allocate energy storage in naval electric ships,” Proc. IEEE Electric Ship Technologies Symposium (ESTS), April 2011, pp. 402-405. C. Xie and C. Zhang, "Research on the ship electric propulsion system network power quality with flywheel energy storage," Proc. Asia-Pacific Power and Energy Engineering Conference (APPEEC), April 2010, pp. 1-3. J. McGroarty, J. Schmeller, R. Hockney, and M. Polimeno, “Flywheel energy storage system for electric start and an all-electric ship,” Proc. IEEE Electric Ship Technologies Symposium, July 2005, pp. 400-406. S. Kulkarni and S. Santoso, “Impact of pulse loads on electric ship power system: with and without flywheel energy storage systems,” Proc. IEEE Electric Ship Technologies Symposium (ESTS 2009), April 2009, pp. 568-573. S. Kim, B. Cho, and S. Sul, “Feasibility study of integrated power system with battery energy storage system for naval ships,” Proc. IEEE Vehicle Power and Propulsion Conference (VPPC), October 2012, pp. 532-537. L. G. Yan, Z. K. Wang, C. L. Xue, Z. Y. Gao, and B. Z. Zhao, “Development of the superconducting magnet system for HEMS-1 MHD model ship,” IEEE Transactions on Applied Superconductivity, vol. 10, no. 1, pp. 955-958, March 2000. C. Su, X. Weng, and C. Ching-Jin, “Power generation controls of fuel cell/energy storage hybrid ship power systems,” Proc. IEEE Conference and Expo Transportation Electrification Asia-Pacific (ITEC Asia-Pacific), August - September 2014, pp. 1-6. T. Yichao and A. Khaligh, “Bidirectional hybrid battery/ultracapacitor energy storage systems for next generation MVDC shipboard power systems,” Proc. IEEE Vehicle Power and Propulsion Conference (VPPC), September 2011, pp. 1-6. T. Yichao and A. Khaligh, “On the feasibility of hybrid battery/ultracapacitor energy storage systems for next generation shipboard power systems,” Proc. IEEE Vehicle Power and Propulsion Conference (VPPC), September 2010, pp. 1-6. J. Hou, J. Sun, and H. Hofmann, “Mitigating power fluctuations in electrical ship propulsion using model predictive control with hybrid energy storage system,” American Control Conference (ACC), June 2014, pp. 4366-4371. T.A. Johansen, T.I. Bø, E. Mathiesen, A. Veksler, and A.J. Sørensen, “Dynamic positioning system as dynamic energy storage on diesel-electric ships,” IEEE Transactions on Power Systems, vol. 29, no. 6, pp. 3086-3091, November 2014. K. Lee, D. Shin, D. Yoo, H. Choi, and H. Kim, “Hybrid photovoltaic/diesel green ship operating in standalone and grid-connected mode - Experimental investigation,” Energy, vol. 49, no. 1, pp. 475-483, January 2013. T. Song, Y. Li, J. Song, and Z. Zhang, “Airworthiness considerations of supply chain management from Boeing 787 dreamliner battery issue,” Procedia Engineering, vol. 80, pp. 628-637, 2014. N. Devillers, M. Péra, D. Bienaimé, and M. Grojo, “Influence of the energy management on the sizing of electrical energy storage systems in an aircraft,” Journal of Power Sources, vol. 270, pp. 391-402, December 2014. R. Barbosa, B. Escobar, V. M. Sanchez, J. Hernandez, R. Acosta, and Y. Verde, “Sizing of a solar/hydrogen system for high altitude long endurance aircrafts,” International Journal of Hydrogen Energy, vol. 39, no. 29, pp. 16637-16645, October 2014. J. Timmons, R. Kurian, A. Goodman, and W. R. Johnson, “The sealed lead-acid battery: performance and present aircraft applications,” Journal of Power Sources, vol. 136, no. 2, pp. 372-375, October 2004. R. C. Bhardwaj, and J. Than, “Lead acid battery with thin metal film (TMF®) technology for high power applications,” Journal of Power Sources, vol. 91, no. 1, pp. 51-61, November 2000. “Helite unveils ultralight aircraft powered by fuel cell alone,” Fuel Cells Bulletin, vol. 2009, no. 5, pp. 4, May 2009. R. O. Stroman, M. W. Schuette, K. Swider-Lyons, J. A. Rodgers, and D. J. Edwards, “Liquid hydrogen fuel system design and demonstration in a small long endurance air vehicle,” International Journal of Hydrogen Energy, vol. 39, no. 21, pp. 11279-11290, July. 2014. S. Bégot, F. Harel, D. Candusso, X. François, M. Péra, and S. Yde-Andersen, “Fuel cell climatic tests designed for new configured aircraft application,” Energy Conversion and Management, vol. 51, no. 7, pp. 1522-1535, July. 2010. “Lockheed Martin ruggedized UAS uses AMI fuel cell power,” Fuel Cells Bulletin, vol. 2011, no. 9, pp. 4, September 2011. “Washington state researchers develop SOFC for aircraft APU,” Fuel Cells Bulletin, vol. 2014, no. 7, pp. 10, July. 2014. A. Nishizawa, J. Kallo, O. Garrot, and J. Weiss-Ungethüm, “Fuel cell and Li-ion battery direct hybridization system for aircraft applications,” Journal of Power Sources, vol. 222, pp. 294-300, January 2013. A. Griffo and J. Wang, “Modeling and stability analysis of hybrid power systems for the more electric aircraft,” Electric Power Systems Research, vol. 82, no. 1, pp. 59-67, January 2012. F. Fazelpour, M. Vafaeipour, O. Rahbari, and R. Shirmohammadi, “Considerable parameters of using PV cells for solar-powered aircrafts,” Renewable and Sustainable Energy Reviews, vol. 22, pp. 81-91, June 2013. “Prototype solar-powered aircraft unveiled,” Reinforced Plastics, vol. 53, no. 6, pp. 5, August - September 2009. “Solar aircraft achieves longest unmanned flight,” Reinforced Plastics, vol. 54, no. 5, pp. 9, September - October 2010. C. C. Chan, L. Jian, and D. Tu, “Smart charging of electric vehicles-integration of energy and information”, IET Electrical Systems in Transportation, vol. 4, no. 4, pp. 89-96, December 2014. L. Chen and Z. Wu, “Study on the effects of EV charging to global load characteristics via charging aggregators,” Energy Procedia, vol. 145, pp. 175-180, July 2018. N. Daina, A. Sivakumar, and J. W. Polak, “Electric vehicle charging choices: modelling and implications for smart charging services,” Transportation Research Part C: Emerging Technologies, vol. 81, pp. 36-56, August 2017. X. Dong, Y. Mu, X. Xu, H. Jia, J. Wu, X. Yu, and Y. Qi, “A charging pricing strategy of electric vehicle fast charging stations for the voltage control of electricity distribution networks”, Applied Energy, vol. 225, pp. 857-868, September 2018. S. Falahatia, S. A. Tahera, and M. Shahidehpour, “A new smart charging method for EVs for frequency control of smart grid,” Electrical Power and Energy Systems, vol. 83, pp. 458-469, December 2016. M. D. Galus, M. G. Vayá, T. Krause, and G. Andersson, “The role of electric vehicles in smart grids,” WIREs Energy and Environment 2013, vol. 2, no. 4, pp. 384-400, July-August 2013. A. Hajebrahimi, I. Kamwa, and M. Huneault, “A novel approach for plug-in electric vehicle planning and electricity load management in presence of a clean disruptive technology,” Energy, vol. 158, pp. 975-985, September 2018. E. C. Kara, J. S. Macdonald, D. Black, M. Bérges, G. Hug, and S. Kiliccote, “Estimating the benefits of electric vehicle smart charging at non-residential locations: a data-driven approach,” Applied Energy, vol. 155, pp. 515-525, October 2015. N. Sujitha and S. Krithiga, “RES based EV battery charging system: a review,” Renewable and Sustainable Energy Reviews, vol. 75, pp. 978-988, August 2017. K. Uddin, M. Dubarry, and M. B. Glick, “The viability of vehicle-to-grid operations from a battery technology and policy perspective,” Energy Policy, vol. 113, pp. 342-347, Febuary 2018. M. Usman, L. Knapen, A. Yasar, Y. Vanrompay, T. Bellemans, D. Janssens, and G. Wets, “A coordinated framework for optimized charging of EV fleet in smart grid,” Procedia Computer Science, vol. 94, pp. 332-339, 2016. D. Wang, J. Coignard, T. Zeng, C. Zhang, and S. Saxena, “Quantifying electric vehicle battery degradation from driving vs. vehicle-to-grid services,” Journal of Power Sources, vol. 332, pp. 193-203, November 2016. Q. Wang, X. Liu, J. Du, and F. Kong, “Smart charging for electric vehicles: a survey from the algorithmic perspective,” IEEE Communications Surveys & Tutorials, vol. 18, no. 2, pp. 1500-1517, January 2016. C. Will and A. Schullera, “Understanding user acceptance factors of electric vehicle smart charging,” Transportation Research Part C: Emerging Technologies, vol. 71, pp. 198-214, October 2016. M. Murnane, and A. Ghazel, “A closer look at state of charge (SOC) and state of health (SOH) estimation techniques for batteries,” Analog Devices Technical Article, 2017. P. Bentley, B. S. Bhangu, C. M. Bingham, and D. A. Stone. “Nonlinear observers for predicting state-of-charge and state-of-health of lead-acid batteries for hybrid-electric vehicles,” IEEE Transactions on Vehicular Technology, vol. 54, no. 3, pp. 783-794, May 2005. Y. Chen, C. Moo, K. S. Ng, and Y. Hsieh, “Enhanced coulomb counting method for estimating state-of-charge and state-of-health of Lithium-ion batteries,” Journal of Applied Energy, vol. 86, no. 9, pp. 1506-1511, September 2009. L. Fang, F. Zhang, and G. Liu. “A battery state-of-charge estimation method with extended Kalman filter,” Proc. IEEE/ASME International Conference on Advanced Intelligent Mechatronics, July 2008, pp. 1008-1013. L. He, B. Xiao, and Y. Shi. “A universal state-of-charge algorithm for batteries,” Proc. 47th IEEE Design Automation Conference (DAC ’10), June 2010, pp. 687-692. A. Jossen, M. Perrin, and S. Piller, “Methods for state-of charge determination and their applications”, Journal of Power Sources, vol. 96, no. 1, pp. 113-120, June 2001. S. M. Rezvanizaniani, Z. Liu, Y. Chen, and J. Lee, “Review and recent advances in battery health monitoring and prognostics technologies for electric vehicle (EV) safety and mobility,” Journal of Power Sources, vol. 256, pp. 110-124, June 2014. A. Guerfi, M. Dontigny, P. Charest, M. Petitclerc, M. Lagacé, A. Vijh, and K. Zaghib, “Improved electrolytes for Li-ion batteries: mixtures of ionic liquid and organic electrolyte with enhanced safety and electrochemical performance,” Journal of Power Sources, vol. 195, no. 3, pp. 845-852, February 2010. H. Wu, D. Zhuo, D. Kong, and Y. Cui, “Improving battery safety by early detection of internal shorting with a bifunctional separator,” Nature Communications, vol. 5, pp. 1-6, October 2014. Q. Wang, J. Suna, X. Yao, and C. Chen, “4-Isopropyl phenyl diphenyl phosphate as flame-retardant additive for lithium-ion battery electrolyte,” Electrochemical and Solid-State Letters, vol. 8, no. 9, pp. A467-A470, October 2014. A. Y. Saber and G. K. Venayagamoorthy, “Plug-in vehicles and renewable energy sources for cost and emission reductions,” IEEE Transactions on Industrial Electronics, vol. 58, no. 4, pp. 1229-1238, April 2011.